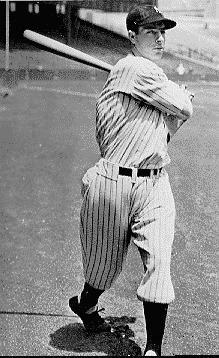 Joltin' Joe DiMaggio the hero that unified America. The Italian immigrant who followed America's golden paved road to greatness, playing America's game in America's most famous city, on America's most storied team, married to America's most beloved movie star. The American public, searching for heroes in the decades of Depression and war, found in Joe DiMaggio an ideal image of itself. What is it about DiMaggio that allowed him to transcend his sport and his time to secure his place in American mythology????? Why did the American public at the time yearn for such a hero???? Has America lost the idealism that pervaded Joe DiMaggio's time???? What kind of heroes do we want today??? One can only attempt to answer these questions by trying to gain clear perspective of Joe DiMaggio's life. He was a shy boy who grew into a quiet but proud man. He went in search of excellence, and found it on the baseball field. His teammates, coaches, and rivals all talk of him with a twinkle in their eyes and with an awestruck tone in their voices. When Joe DiMaggio retired from Major League baseball, many felt they had lost their hero. But, Joe DiMaggio never left the American public scene, marrying movie star Marilyn Monroe and once again placing himself in the national spotlight. Through it all, Joe DiMaggio understood the power he had over the American public, and he felt a great responsibility to inspire and lead his every fan as best he could every day of his life. He is referred to in history as the "Greatest American Icon" and "The Last American Hero". He has been made to represent American idealism, and he stands for an American past looked upon wistfully by newer generations. In the 1960s, Simon and Garfunkel posed the question, "Where have you gone Joe DiMaggio, our nation turns its lonely eyes to you?" Is America in need of another hero, or will Joe DiMaggio's legend survive the test of time and remain America's golden boy forever?